The next quarterly meeting of 100+ Women Who Care will be Feb 6 at the Bloomington Country Club, 3000 S. Rogers St.
New This Year: The Richard M. Schulze Family Foundation has selected 100+ Women Who Care to participate in its matching grants program, providing a 50 percent match of total dollars raised per meeting (up to a $5,000). The matching funds will go to the nonprofit organizations chosen each quarter. 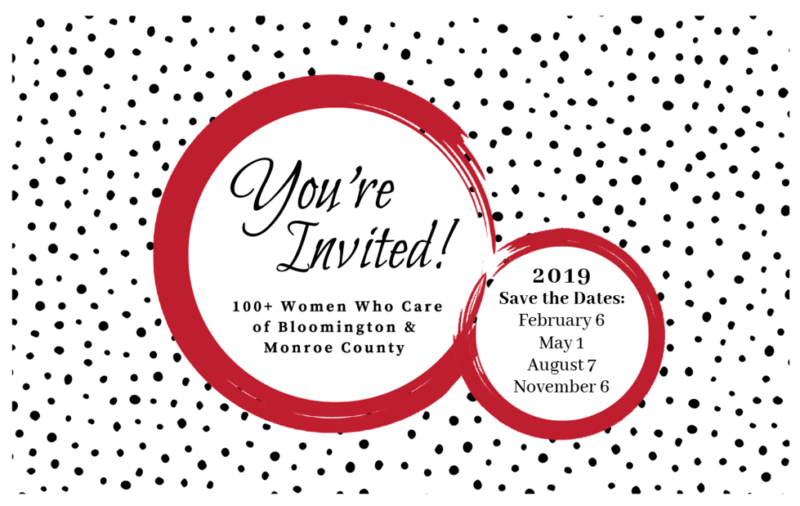 100+ Women Who Care of Bloomington & Monroe County is a group of local women who pool money each quarter to support local not-for-profit organizations. Guests are welcome, and new members may join at any of the quarterly meetings. Registration and socializing opens at 5 p.m.; the meeting will start promptly at 6 p.m. and end at 7 p.m.
100+ Women Who Care is open to all women in Monroe County who wish to support local nonprofit organizations. Each member makes a yearly donation of $100 to the Community Foundation of Bloomington and Monroe County. The group meets four times per year and votes for a local not-for-profit to support. Each member donates $100 to the chosen charity, for a total annual commitment of $500. Women age 35 and younger may opt to join with an annual commitment of $250 instead of $500. Complete information is available at http://100pluswwc.wordpress.com/. Visitors are welcome to attend a meeting before joining. Contact Jocelyn Bowie, jocelyn@semmel.com, with any questions.